In October, I was sitting in at the Indiana Non-Public Education Association conference in the Indianapolis Convention Center, enjoying new professional friendships with a couple of Lutheran administrators… trying to hold back judgment on the presentation “Common Core Standards and Assessments” by a young man from the Indiana Department of Education. Admittedly, we were potentially a hostile audience – private school administrators who as a breed tend to lean toward distrustful when presented with legislated educational policies. However, we were mostly faith-based administrators who whole heartily try, as St. Ignatius would challenge us, to presume good will. The good will lasted until slide #4 (the presentation can be found on the IDOE Resources for Implementing Indiana’s Common Core Standards page). At Slides 5 we leave the hallowed halls of the Common Core and move to the more important issue… the test with which we will MEASURE the success or failure, not of the Standards, but of the children and teachers of Indiana schools. For us this means the Partnership for Assessment of Readiness for College and Careers (PARCC). I’m a primary source kind of gal… And my coursework at Indiana University’s School of Library and Information Science (and ensuing Masters in Library Science) makes me a killer on the Google…. I decided to read, for myself, the originating document posted on the Common Core State Standards Initiative website. Looking over the Introduction (June 2, 2010) and Key Considerations for the English Language Arts & Literacy in History/Social Studies, Science and Technical Subjects document the good intentions of the document are evident. You may have read the Washington Post “The Answer Sheet” post this week on America’s Next Education ‘Crisis’ – and Who Benefits. Valerie Strauss looks at who really benefits from the public discourse in education these days and lands firmly with the for-profit businesses selling curriculum, textbooks, consulting and data warehousing software. The pavement cracks under the cash load… how can a document be “living” when an entire industry is evolving on a static document? The textbooks, supplemental websites, curriculum pacing guides, webinars… are all being designed around the Standards created and taken off life support. Let’s not kid ourselves; the Common Core is not a living document. It died the day the money fell from the luminous Kentucky Performance Rating for Educational Progress (K-PREP) data enhanced sky. Remember teachers? Heck, remember professional judgment? I for one spent years in an undergraduate program to study not only my content area, but also educational philosophy, pedagogy and methods before entering the classroom in 1992. Contrary to what some would have you believe, the majority of teachers I have worked with over the past 20 years have cared deeply about students… spending long hours planning activities to meet learning objectives, personalizing experiences for individual students and listening to countless stories of “look what I found on the way to school today…”. Let me give you all a little hint, when one posts a presentation online, one might want to make sure the speaker notes are not visible. 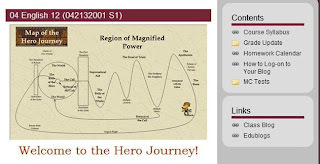 Back to our presentation…. At this point, the young presenter from the IDOE on that October morn looked earnestly at the now hostile audience and said we shouldn’t worry about what to teach … we should “trust the Standards” (his words) and let them be our guide. And with one simple phrase the faiths of the world came together in a common question- how is this good for our children? 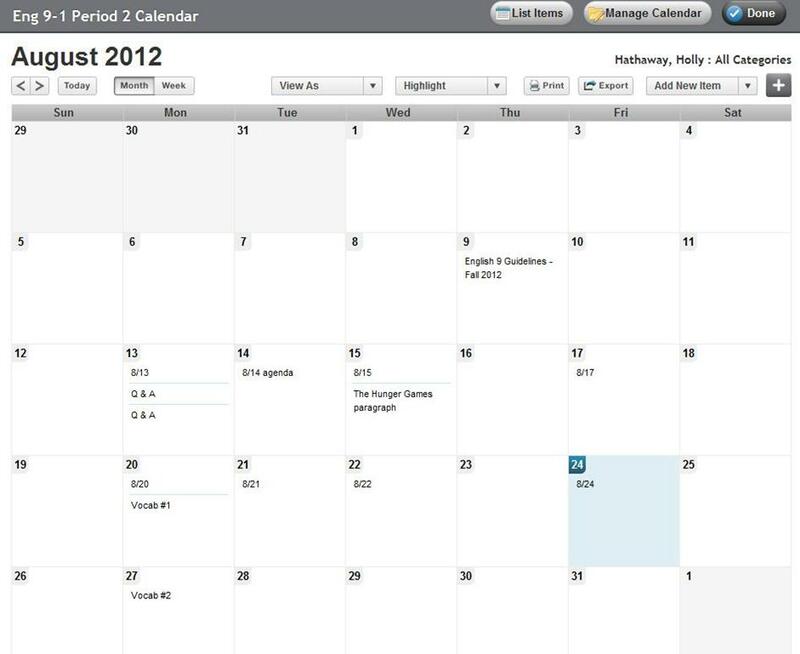 December 2012 will be our first round of 1:1 BYOT Final Exams. In my spare time (all five minutes of it in airports), I’ve been reading up on assessments in 1:1 environments. 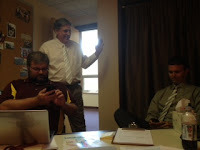 At the JSEA Tech Directors Conference, I had a couple of conversations on assessments when students have personal devices. Since I have spent so much time in the real world lately (and not in the blogosphere) I thought today was a good time to summarizing ideas from print and interpersonal conversation... So I offer these guidelines for consideration during this most wonderful season of final exams! 1. Consider your objective(s) and work backward. In other words, don’t start with the noun (device)—start with the verbs (analyze, create, compare/contrast, develop, argue). 2. Open ended questions (strong on application and/or synthesis) are harder to cheat. 3. Do not overburden exam proctors with complicated instructions or expectations (i.e. if you don’t want students on Google during the exam...recognize the student/adult ratio in the room and the fact there is most likely no screen monitoring software). 5. Consider other ways of turning in assignment (email, Dropbox, shared Google Doc). · Parameters for use of device during exam—can web searches be done during exam? Just word processing? Can notes or prior documents be opened and referenced? 2. Make sure students are familiar with the format/tool of the exam. A final exam (or other high stakes assessment) may not the best time to try a brand new tool. 3. Clear notification to students and parents of ramifications for cheating, plagiarism or other unethical behaviors. 1. Understand that devices may be in use during exams. 2. Read directions from academic teacher carefully. 3. Remind students of parameters for device usage (see above). Hold students accountable. ** Other ideas, suggestions or general brilliance are welcome in the comments section! A look at how we changed Professional Development from noun focused to verb focused. JD has the other presentation posted on his side... check out Designing Toward Digital Citizenship: Rethinking Computer Curriculum over at Confessions of a School CIO. 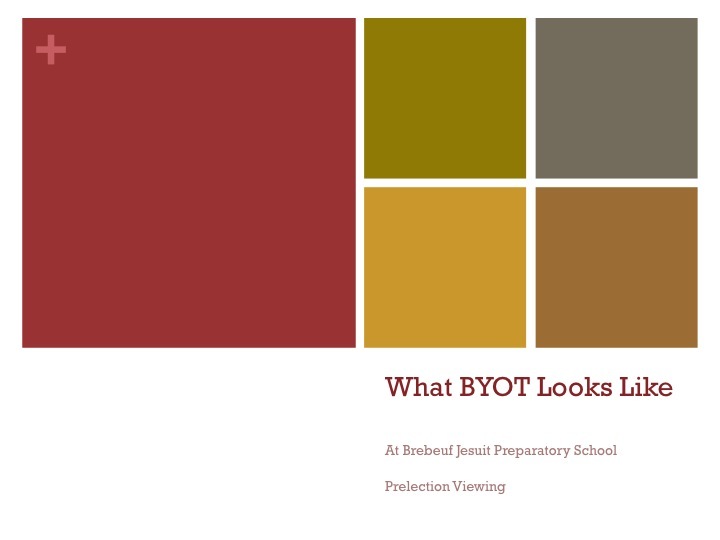 A photo essay on What BYOT Looks Like at Brebeuf... played before presentation. A revitalized classic presentation - looks at our discernment process leading to our 1:1 BYOT learning environment. 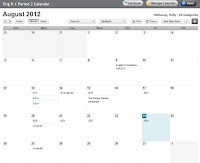 Today (October 20, 2012 for those of you time shifting) we are off to ISTE's Leadership Summit here in Indianapolis. Purely observers for this one! November 13-18 we'll be at the JSEA Tech Directors Conference in New Orleans - our first keynote... it's going to be EPIC! I think we'll make a Jen & JD Show episode of it. And then we collapse into an introvert coma... once revived the blogs will once again flow. Unless somewhere in the real world I get bored, annoyed or delayed at an airport. Cheers! A while back I wrote about Kenneth Burke’s concept of trained incapacity. Funny story… my husband went on a cleaning kick a couple of weekends ago and surfaced from the dust with Daniel Goleman’s Working With Emotional Intelligence (flash back to the late ‘90s when business was influenced by education … 1998, the golden year). On page 44 of this classic is once again the idea of “Trained Incapacity”… but with a twist. Goleman uses the term to describe Computer Nerds (before being a nerd was chic) who had such specialized knowledge that all interpersonal skills were essentially trained out of them to make room for all the cognitive smarts (explaining @jdferries and his ZERO score in Feeling on the Meyer’s-Briggs Inventory). The emphasis on the cognitive, the measurable… the right answer trains out the "soft skills" of interpersonal communication, broad scope critical thinking and analysis. As the selfsame @jdferries and I were discussing the high level of frustration amongst students who resist open-ended, critical thinking assignments (just tell me what you want and I’ll give you the answer! )… which led us on our typical late day, coffee powered dialogue…. ending at the conclusion that we (educators/parents/legislators) inadvertently train students to be incapacitated… we’ve trained them well that there is a correct answer which in turn translates to a grade which reflects mastery of a skill. JD’s took this further in his parallel post “On Stopwatches...We’ve Trained Them Well”. This product promises to AUTOMATE the pre-conference, post conference and teacher growth plan while providing REAL TIME data to Central Office… all while PERSONALIZING the process with rubrics they provide (emphasis theirs – and yes, it’s as ANNOYING in the flyer as it is in this post). It seems we are training teachers and administrators well… To think that there is a correct way to teach. This correct way can be measured via a computer form, automated into a report that is directly uploaded into a data warehouse to determine teacher performance. I argue this insistence of the correct way to teach is creating teachers who are trained to incapacity. Techs complain teachers won’t try a new technology… of course! We’ve trained them to wait until some PD trainer comes by and instructs them on the proper way to use the tool. Administrators complain teachers won’t try a new, innovative educational model…. of course! We haven’t held a training explaining the 6 (+ 1) traits of the model and how to incorporate the model into the standardized, paced curriculum. Students complain the class is boring…of course! We outsourced evaluations to a vendor created rubric which has a box to check that students are “quiet and in order” so classroom practices ensure quiet and order. We are training the art out of teaching with our insistence on objectively measuring, in the most time efficient manner, the specialized knowledge of the trained professional educator. And we only have our data driven decision-making selves to blame. like shepherding and accompanying those entrusted to us along the path of knowledge, truth, and discovery? I suggest you take the time to watch his keynote. It will change you. It will change your view of the purpose of education. I will give you a hint… the purpose is not a correct answer in a box sent in real time to a data warehouse at the Central Office. Brainstorming at a workshop "If You Could Build Your Ideal School..."
Several Twitter #chats of late have focused on professional development… usually surrounding the idea of how to engage teachers (or more cynically – devolving into how to get teachers to show up for PD trainings and why teachers won’t try anything new). Many a tweet bemoaning the lack of teacher interest in after school lectures on using social media in the classroom, Stage Two intervention strategies, setting Student Learning Objectives (SLOs) for the Indiana RISE Evaluation program… Topics which advocates claim increase student learning and student engagement because students will achieve if only we meet them where they are and engaging them in the mediums they prefer. Ok - I buy that "meet them where they are" argument. But I seldom hear the same thing about engaging TEACHERS as LEARNERS where they are and through the mediums they prefer. 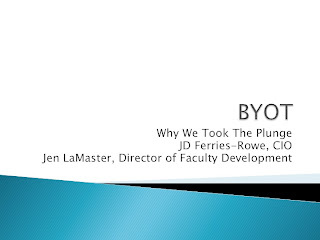 I’ve written before about shifting from Professional Development to Faculty Formation. Last January, a small team of faculty/administrators (myself included) began a journey with the Jesuit Secondary Education Association (JSEA) model of faculty formation. First we inventoried our formation offerings within three areas – Professional, Personal and Spiritual. Try this exercise… make a 3 column spreadsheet, graph, drawing, 3D model out of clay (BYOT baby…). Then fill in all the development opportunities your school offers under each category…. It’s okay, I’ll wait….. I will share our experience… by far our fullest column was the Professional. We offer travel/registration funds, webinars, newsletters, after school/brown bag lunch/just in time workshops… and collaborative professional development locally (Indianapolis private schools), state associations, regional (Independent Schools of the Central States), national (Jesuit Secondary Education Association) memberships/workshops/conferences/materials. Our second column was Spiritual (we are a Catholic school after all so we hope we have this one covered) full of new teacher monthly formation meetings, prayer groups, Spiritual Exercises, retreats, spiritual directors. Our distant 3rd was personal… (we do have an awesome Wellness Committee working toward making us healthier and Wellness Center to sweat in). But how many PD types really address formation on all these levels? (Not me for one) How many of us administrators are just focused on “professional” opportunities to beat the test (AP Workshops), meet the mandated evaluation requirement (RISE Indiana), or integrate technology (but we bought all those iPads, Jen….). How many of us are actively planning growth opportunities for the whole teacher? We talk a lot about educating the whole child. And that’s great! I and a lot really, really smart Jesuits concur… but what about the whole teacher? Even the business world understands the importance of care for the whole employee… why else does Fortune Magazine rate the “Best 100 Companies” every year? (On the list of amenities for 2012 are cafes, bocce courts and other fitness facilities, flexible work schedules, telecommuting, eye brow shaping… and educators are spoiled?). So let’s start 2012-13 with this challenge… look at the whole teacher and try some formation focused on professional, spiritual (you can insert “mind” here o’public school friends) and personal growth. Try developing the whole teacher - I bet you find a few more people darkening your door. May the road rise up to meet you. May the wind always be at your back. May the sun shine warm upon your face, and may your development sessions be full. PS – remember your administrators too! We are people too… really, we are… and we like non-fat vanilla latte’s on bad days (thanks @msmooreenglish)! Always helps to post clear directions as to what assignment is and expectations for delivery (how student is to get assignment to you). Now that every student has a device - our learning management system (BlackBoard Engage) is a stronger tool. 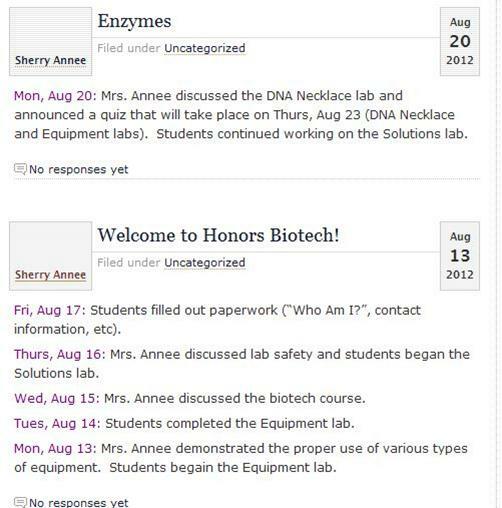 Example from Ms Hathaway (Theatre) using Edline Calendar : Each assignment is linked to calendar. 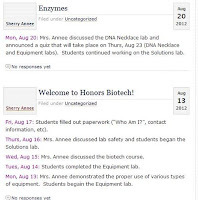 Student clicks on day or assignment and is taken directly to Homework Hand-in. 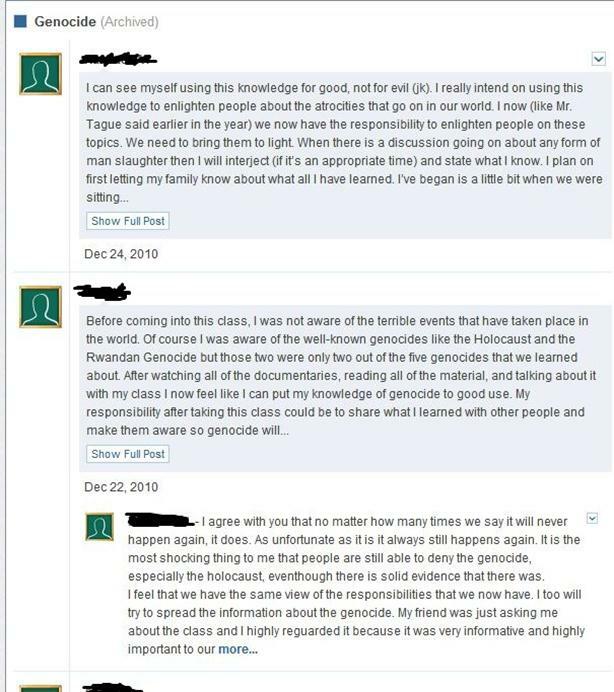 Or in truer journaling as reflection based on experiences with new material… as this photo from previous semester in Mr. Tague’s Genocide course illustrates. Tool is Edmodo.com. US History Students in Mr. Lo's class were asked to created picto-notes (taking a concept and illustrating). Most students used pencil, paper and markers to create artwork after researching online. Some students animated their picto-notes in Photoshop. 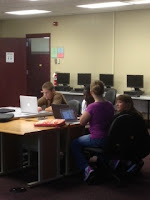 And here's Computer Science (notice all those lonely desktops) with Ms Dugan... collaborative research project on history of computers. The key to BYOT is choice… allowing students to access tools, evaluate their usage for the learning need and use the tool successfully. You really can't upload a document to Blackboard Engage (formerly Edline) from an iPad. To be fair, you can't upload any document off an iPad because the files structure is unreachable unless you perform an illegal maneuver which we do not advocate. And then along comes Mr. Travis Curry from the depths of the Science Department (we hide Science in the basement)... with the words of wisdom "We have to be flexible." And he's right. These challenges are not inherently bad. We learn from the failures, the frustrations, the work arounds. The challenges of 5 operating systems in the hands of teenagers only make us more universal in designing lessons - we are learning there is more than one way to do an activity. The challenges of 5 operating systems in the hands of teenagers is the TEENAGERS have to think critically about what they need to do and weigh the pros and cons of the tools available to perform the action. The learning objective we set out to achieve - access, evaluate, use - is realized every time a document needs to be uploaded, a paper formatted, an etext accessed and a password recalled. In December of 2011, the Chronicle of Higher Education ran a story about employers and the need for critical thinking and problem solving skills by college graduates. Actually, this idea has been around the media a couple of times: USA Today and even at a certain state's expense... well, I can say we are encouraging our students to think critically. Juniors who ran into the file upload issue found CloudOn, created Dropbox accounts and successfully came up with a system for the class to work. And the teacher was flexible - this student led solution was fine with him. Spanish students who couldn't view the flash video assigned worked in collaborative groups - and the teacher was flexible realizing the learning objective was achieved equally in group work as it would have been independently. One young man with a Dell and a dying network card learned how to troubleshoot hardware versus software to narrow the possible causes of his computer not connecting to any network home or school. As many of you know, Brebeuf launched it's 1:1 BYOT learning environment on Thursday, August 9th. For those of you new readers... 1:1 refers to one computer per every one student. 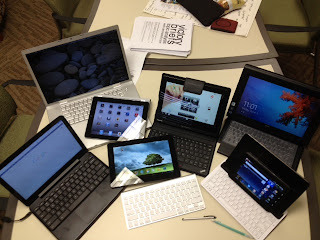 BYOT refers to Bring Your Own Technology... students were able to chose the best personal learning device for them (we support iOS, Mac OS, Windows, Chromium, Android, Windows Mobile and are testing Windows 8). 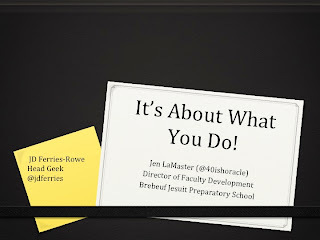 @jdferries is blogging in somewhat live time over at Confessions of a Jesuit School CIO... and quite frankly knocking it out of the park so I won't even try. Check out his reflection of Day 1 and Day 2 by following the links. I've been reflecting on the Professional Development side of the process this weekend. I had a good day with BYOT. 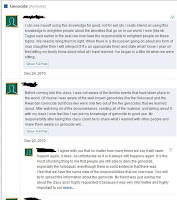 I was able to set up all my students with Edmodo in my Genocide class and my AP Macro and APUSH classes were able to connect. I have a question regarding PDF's and what would be the best way for students to use them on a computer. Fair question...How best to use, navigate and annotate static content. Am thinking of where students should send recordings when I’ve had them all record themselves singing one of our choir pieces. Wow! Great question...There’s a specific learning need met by a 1:1 environment – recording the individual voice. So…, how do we sustain this in the long term? And there it is… the dust hasn’t even settled and the question of sustaining momentum come up. I have been a little torn on this. I thought JD and I could sit back, at least for a month, to regroup and rest a bit. I truly expected a slower grasp of enthusiasm and sense of adventure in change. I thought we'd still be building some momentum. I am forced to accept the error of my thinking. So how to we sustain for the long term? This summer, at the International Colloquium for Jesuit Secondary Education, I listened to Daniel Villanueva, SJ (@danivillanueva) lay out what is probably going to be my focus for the next three years. He spoke of moving technology from systems of support to systems of advocacy. Right now, Brebeuf is in a system of support. We have structure to support learning – BlackBoard Engage as learning management system. Google Docs to support production of documents, spreadsheets, presentations… the business of being a student. We have Rediker Administrators Plus and Admissions Plus to support the business of our academic and admissions processes. We have a wireless network to support 6 or so operating systems. 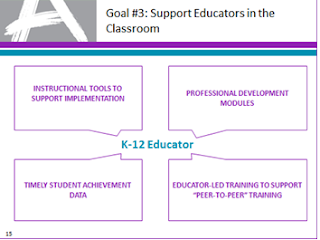 The next step is to move beyond these supports and into advocacy. Advocacy as in morally and ethically working to influence social, political, economic decision making. In Jesuit terms – developing men and women for others in our students and faculty/staff. Men and women who will use their talents, resources and technologies to promote equality of education (local, state, global). Men and women who promote excellence in teaching not only within our walls but into the national scene. Men and women who fight for justice, who engage in dialogue and act with solidarity with the poor. In his keynote, Dani spoke of the power of social media at World Youth Day in 2012. Empowering young people to speak with the voice of social media. The adults created the system of support (wifi hotspots, starter blog, couches) and the students created advocacy structuring dialogues on justice via Facebook, Twitter and blogs. As I have written before, point the way and get out of the way. Moving from systems of support to systems of advocacy will sustain the remarkable momentum we have going. We have the support systems in place. Now we can turn our eyes to the power of these systems in our student’s hands. Not sure exactly how this will play out... but it’s exciting to think about! Those of you following me on Twitter know I have spent the week in Boston, MA at the first ever International Colloquium of Jesuit Secondary Education (#ICJSE if interested). My mind is still spinning on the week - the conversations, keynotes, break out sessions, friendships... I even met face to face with PLN'rs @danivillanueva and @rectorsrumbles among others (@bhobbb63 and @marijsea I already see regularly but if I don't mention them I will hear about it). As I sit here at Logan Airport (and a shout out to the TSA guard who teased me about the number of electronic devices in my backpack....), I am just starting to process my experiences. I will start with a story of my morning today... 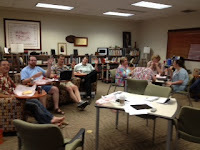 I was in a break out informal session on Faculty/Staff Development. Circled up were educators from Tanzania, China, Madagascar, Micronesia, Phillippines, India, Australia, Spain... After sharing challenges and successes the question was asked "Can we continue to share resources beyond this time and space?". Within 2 minutes the moderator from India had volunteers from each major region (guess who is representing the United States?) providing emails for a listserv. Within 5 minutes, the Australians had a Wordpress blog set up. Instant, global connections...sharing resources, ideas and a passion for educating young people was realized. What if...the art of education was about making the impossible possible? Today I saw the impossiblity of global collaboration made possible. Going forth into the world, with a click and a little imagination for the children across the globe. NOTE: Some of the comments to this piece have gotten well out of control, involving threats and obscenity to other commenters and myself. While I welcome and encourage comments from all points of view, obscene remarks are removed and not tolerated. I’ll be happy to jump back into the conversation and reply to some comments when those who are misusing the forum settle down. And it happens in our hallowed halls of educations. During Sal Khan’s keynote address at BlackBoard World, the backchannel Twitterverse lit up with anti-Khan sentiment. 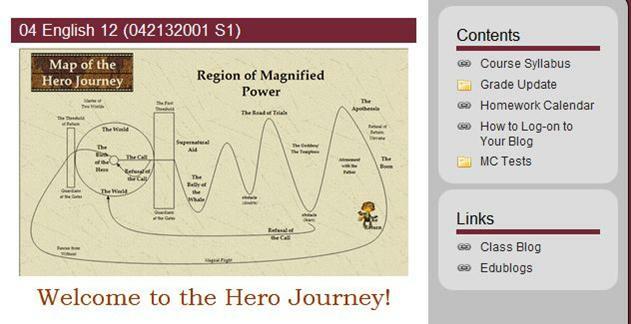 Heck, I posted a picture of me standing cheesily before our presentation title slide to my college speech team alumni page and got a flame message about learning management systems being “so 1997”. (Really – flamed on Facebook... and from an alum who is an ed tech consultant!). 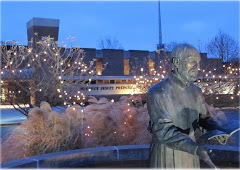 I just returned from the Jesuit Secondary Education Association’s Symposium focused on building adult Ignatian Learning Communities in our schools to meet the challenges of education for 2020. In table discussion, we explored our individual orientations and in dialogue identified where our trained incapacities hindered forward movement. We openly explored alternative strategies, weighing pros and cons based on experiences. In an electronic manner, I participate in a similar experience in Twitter #chats (#BYOT Chat – Thursday nights at 9pm EST for a shameless plug.) These two venues allowed for multiple orientations to dialogue without hyper-criticism and name calling. Ideas are freely shared, given and accepted. I think Burke was trying to point out the challenge of dialogue when dealing with topics that make people uncomfortable – because the dialogue challenges existing orientations (again, context is key people). Related to educational technology – online learning, 1:1 initiatives, eBooks, mobile tools – the past 5 years have seen a dramatic upheaval in how we communicate, collaborate, consume and create. The alternative strategies may be overwhelming as they change the orientation too fast or dramatically. Asking an educator to embrace a 1:1 program when they have never had a personal laptop is disorienting. Criticizing that same educator for trying to avoid or escape (I hear "resistant to change" a lot) is unfair. I hope we remember this as we enter the 2012-13 school year. Recognize context – experience alternative strategies – reflect on how to reorient in light of experience. St. Ignatius in 1524. Kenneth Burke in 1954. You and me in 2012… This will take time - more time for some, less for others – but settle down, settle into the dialogue and together, settle some of challenges in orienting education in the 21st century. If you haven't noticed, JD and I are down in New Orleans for the annual BlackBoard World educational extravaganza. Check out the most excellent, and actually OFFICIAL (he got a button and everything), BlackBoard Blogger over at Confessions of a Jesuit School CIO for details of the event. It's been a good week. We've met some folks, learned a bit about why BlackBoard bought Edline (probably something to do with 20,000+ K-12 clients) and saw the sites of New Orleans. We've been acting like people who don't ever leave the Midwest very often and posting pictures of food, churches and an epic riverboat cruise of the Mississippi shipping lanes on Twitter like crazy (and occasionally Facebook and Instagram) so feel free to peruse our 21st century chronicle of our adventures. And we found time to film the ever growing in popularity (we're up to 20 views!) Episode 3 of the Jen & JD Show! Enjoy. In his book Permanence and Change, Kenneth Burke discusses the idea of “trained incapacity” (the origins of the term – maybe Veblen, maybe not – is not the point here for the one or two Communication scholars who may stumble upon this blog post). For Burke, trained incapacity infers training so ingrained in the learner’s orientation (context in Jesuit speak) that the learned way of doing things efficiently works against future success. In a Pavolian example utilizing chickens trained to a bell food signal and then receiving punishment for following the bell… Burke concludes, “With their past education to guide them, they would respond in a way which would defeat their own interests.” Or to use his human example, business(people) who have been so trained in one form of competitive finance that they cannot see the value in alternative strategies and refuse to change strategies even if economic environment changes (hmmmm….can’t imagine what that would be like…). As educational technologists, we too have our trained incapacities. Our orientation of school is still students in neat rows, quietly working on the same task to become the most efficient college student/worker/voter/adult. I am dismayed at the number of advertisements from technology vendors I receive which show rows of students with the same device sitting, blind staring at the screen. I am annoyed at twelve year old Inter-Active Whiteboard technology touted as new and innovative when it is still a teacher at the front of the room making “knowledge” happen on a board. I start yelling when I read of tablets as textbook replacement – same model of read and answer the questions at the end of the chapter (with pencil) but using a device which could open the world if not locked down from gaining Internet access. School still looks like it did in 1920… only with more demands on electricity and a bit more shine. We respond to the shiny-pretty food bell as quickly as the chickens in Burke’s narrative. Where do we block alternative practices with the phrases “It will never work” or “We tried that in the 90’s” or “The students will just go to Facebook”? Where do we block alternative practices because it is noisy, messy and not in neat rows? Being open to growth is a Jesuit goal of the Graduate at Graduation – a value we consciously strive for in all our graduates. As educators, let’s have the same openness to growth and change. Our BYOT model is an alternative strategy. In dialogue with students, teachers, parents and vendors we have challenged orientations. We have asked people to let go of past educational orientation. 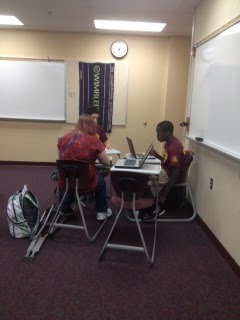 August 9th is a big day for Brebeuf – our first day of 1:1 BYOT. It’s frightening, challenging and exciting for me. A challenge to my 20+ years of training in education which is disorienting when all my past experience is also learning in neat, hushed rows. Neat, quiet, geo-specific rows is not the world our students will inhabit. I need to be open to alternatives to facilitate their movement into a world I cannot imagine. I challenge us all to reflect on where our training as educators and technologist incapacitates us and to be open to alternative strategies… and beware of those food-bells.